They swing, they croon, they play down-home blues, they lay down hillbilly grooves that will wear down your shoes! The Muddy Basin Ramblers do all this in an unlikely place, Taipei, Taiwan, aka Ihla Formosa. But that's part of the charm of this band. The Ramblers are a group of seven US and UK expats, many of whom have lived on the island since the 1980s. They bonded through a shared experience of living in a foreign land, beer-fueled jams in the Formosan wilderness, and a love for all roots music. 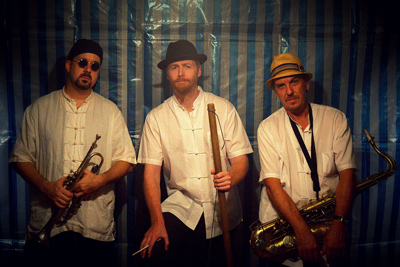 The "Muddy Basin" is the band's affectionate nickname for their adopted home: Taipei is located in a geographical basin; it's subtropical climate brings a lot of rain; the band has spent plenty of hours navigating the city's mud-caked hiking trails in search of the perfect outdoor jam spot, instruments and bags full of Kirin and Asahi beer in tow. A "skiffle band" at heart, the Ramblers cut their teeth playing standards by the Memphis Jug Band, the Dixieland Jug Blowers, and the washboard jazz bands of the 1920s and 30s. Then they started spiking the bowl with their own bathtub gin, tailoring pre-war sounds, along with some quirky influences, to create their own original music. Little did these Ramblers know when they began in the early 2000s that they would help start a craze for swing music retro-culture in Taiwan, that one of their original songs would be featured in a commercial for Nissan, or that one of their CDs would even get nominated for a Grammy (for best artwork/packaging, and the music is darn good too, we promise!). 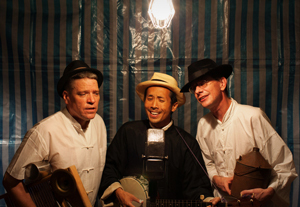 Throughout the years, the more the Ramblers rambled, the more they found themselves doing fun, memorable gigs and events: In 2004 Michelle Shocked came to Taipei for a few gigs, and the Ramblers wound up being her backing band. In 2015, they sojourned to Japan to meet their jug band brethren across the sea, headlining the Yokohama Jug Band Festival. In 2017, they played for an audience of 10,000 at the National Concert Hall's Summer Jazz Fest. 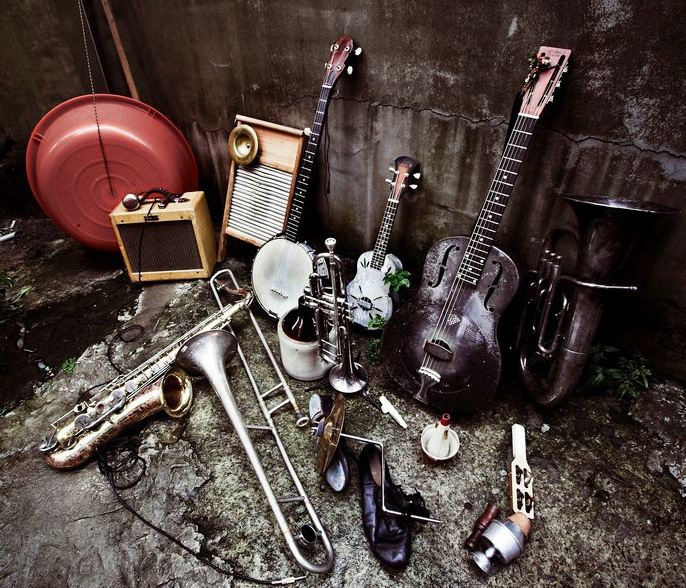 "Jug band music? All the way out here? What?" The Ramblers get that response a lot from expats and foreign visitors in Taiwan. American visitors find themselves "transported back home," while locals are often surprised and charmed by the "down-home, homemade" instruments, such as the washboard or the band's very own "Formosa Fiddle," a washtub bass made of one of the ubiquitous orange and green plastic tubs found in hardware stores across Taiwan. Taiwanese fans often call them the "the band of foreigners who love Taiwan." ORIGINAL MUSIC FROM THE "MUDDY BASIN"
The "Muddy Basin" is indeed an inseparable part of the Ramblers' music. After years of jamming in parks and bars, the band wanted to go beyond re-hashing and reinterpreting the old tunes (as fine as they are), so they started playing their own material, a fair amount of it inspired by life on Ihla Formosa, a little history, and some imagination. David took up the songwriting mantle, reading up on the history and folklore about their musical heroes from the early 20th century, namely the many African-American blues and jazz pioneers and hillbilly country stars of the early 20th century. He dove into the history of medicine shows, learning about the complicated relationship between minstrelsy, blackface, and modern pop as we know it today. He also started seeing early American music's connection to and influence on Asia – for example, how jazz trumpeter Buck Clayton played a pivotal role in the formation of Chinese pop music. The stories accumulated, some of which made their way into the Ramblers' soul-affirming, rollicking album "Formosa Medicine Show" (2013). With the album's songs, painstaking care was taken to respect the spirit of their musical heroes, but also to push the music in new, thoughtful directions. 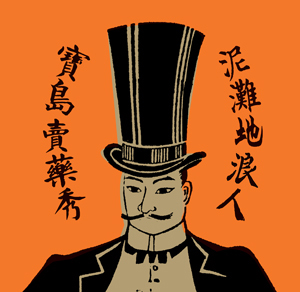 For example the band bridged American style jazz with Taiwanese folk styles such as Nakashi (a hybrid of Japanese Enka, imported during colonial times). "Formosa Medicine Show" earned the band an even wider following in Taiwan, and the CD was nominated for a Grammy in 2015 for Best Art Direction and Packaging. The Muddy Basin Ramblers are: David Chen, originally from Chillicothe, Ohio, on vocals, guitars, drums and banjos; Cristina Cox, of Scranton, PA, on violin, mandolin, and various wind instruments; Tim Hogan, of California, on washboard and percussion; TC Lin, originally from the US but now a proud Taiwanese citizen, on washtub bass, baritone, and trumpet; Sandy Murray, of Scotland, on ukulele and tenor and soprano saxophones, Conor Prunty, of London, on harmonica, washtub bass, and ukulele; Will "Slim" Thelin, from Omaha, Nebraska, on jug, tap shoes, kazoos, trombone, and vocals.